1. I'm going to miss having preschool mornings to go for a run this summer, when the boys are out of school. I hope I can manage to wake up super early most mornings, like I did last year, to run and shower before Paul leaves for work. d.) ah, what's a little pee amongst kids? have at it! 4. 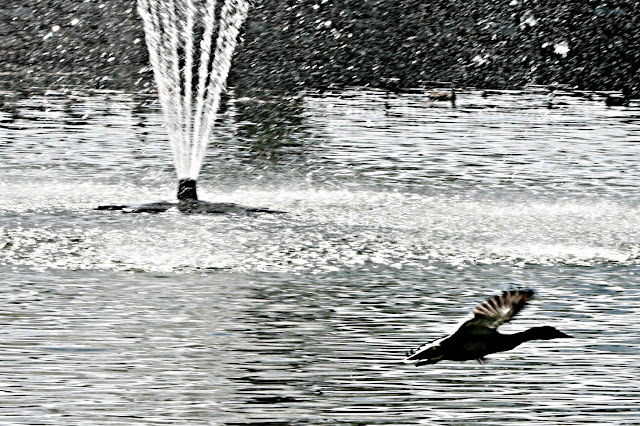 I took this photo at the duck pond. I now think ducks may be my favorite animal to photograph. They're fun. And dramatic. I like a little drama in my animals. Snails? Maybe not as fun to photograph. 5. It's yard sale season and I am loving that! Stay tuned for my answer to question #2 next week. Linked today with Nancy from A Rural Journal. one reason why i don't like bouncy houses ... gross!! yuck!! nasty!! i wonder why the rain keeps doing what it is doing ... rain. sun. rain. sun ... so wild! I'm sick of the rain too ! Hope you have a fantastic weekend Lisa !!! Have fun at your yard sales -- I need to declutter, so no yard sales for me! IHi Lisa I think many a kid has slid through someone else's pee and survived it was better if you did not know and just smelled something funky in your car or house later:) Can't wait to hear what you did. Ok, now I am going to be wondering what you did about the pee pants issue. HA HA ! The bouncy house issue is not one I had thought about before...thanks! :-) I tend to give my kids a thorough cleaning when they are done using fair type rides, but I let them have at it while we are there. I love your duck picture. I think I would have worried about the pee. I hope you find the time to get in your run. I am an avid walker and love a good walk to clear my mind and recharge. I tell the child's mom so she can pull her out of line. Mom probably doesn't have a clue. Please, send more rain to us here in all of Texas, and to Kansas as they need it badly too. We had rain this week and I was loving it! If you like ducks, you should photographs some swans some time. Talk about divas!! Hmmm, well, since I would not want my children to reek of urine in the SUV as I drive them home, I would alert the management while holding my child's hand and explain to them what happened. Why not just be honest about it? Nope... would not let my children get someone else's pee all over them. That's just nasty! I'd probably "disinfect" Livie with wipes afterwards and put her in the tub as soon as we get home. Can't make 'em miss all the jumpy house fun so a and b aren't options. Ducks! Livie and I love them! Since I'm a bit of a germaphobe I would have made an excuse and put my kids in the car to go straight home. I'll be interested to hear how you handled it. That is a dilemma about the peed bouncy house! I have to get up very early a few mornings a week to get my run in before showering and getting to work. I know you of all people can do it! Ew on the bouncy house. I don't know- I probably would have let mine go so I didn't have to deal with them getting upset about it- but I'd wonder where her mom was and why she didn't see it. Yard sales are awesome! :). I love duckies too. So much fun. And i like the way they talk. we've 8 ducklings across the road from us, they are little devils to photograph. You young Mom's are incredible, imagine getting up earlier to jog, beautiful photo. lol this post was super funny. I do not like bouncy houses myself. Most of the time I just go to the private parties where the people have rented one. Cause hey, you know them right? Still... when those houses arrive, I have noticed myself they are never super clean when they set them up. They are just "gross" period. I think the tubes at the fast food places are worse... since kids leave food in them. I myself try not to think about it too much. It just adds stress. But when I can see the dirty-ness and such I am the type to try to explain that maybe this time we should skip the house. Luckily my kids are pretty good at excepting things the way they are. Can't wait to read you answer to it though. It will probably make me laugh all over again. I am the wrong person to ask about the bouncy house/pee issue. You know I would have a hard time being there in the first place! :-) But if I were a mom, I would have to change my way of thinking, I'm sure. I hope you do get time to take your runs this summer. Kudos to you for being able to get up so early to do it! I'm tired of the heavy rains, too. We need the water, but when it starts flooding--too much! I'm looking forward to your answer. We didn't have bouncy houses when my children were growing up. I'm leaning towards (a) because the other choice don't sit well with me. I don't have kids, but I think I'd let him or her just slide down and clean thoroughly afterwards.. I love yard sales, too! Letter C definitely!!! The girl should not be embarrassed and the boy should not be disappointed. What did you DO?? A long time ago, I read a medical book that said that urine is sterile, and I have been much happier dealing with these situations ever since! Otherwise I would be freaking out. Nevertheless, a good bath when you both get home. The thing is these days, alerting a parent to the pee issue; you never know how they'll respond. More than likely, had the mom known it, she decided the heck with it. I have a feeling you let the boys go anyway. So, I'll be anxious for your answer. That's a great photo, Lisa. We've had enough rain here for a while also. Happy Mother's Day weekend to you. Interesting post! lol We had "bouncy house day" sponsored by our PTO at 3 of our district schools this week. What to do about that issue?! I almost photographed a snail this week. Seriously. We have been on the same wavelength! Rain, rain go away..... as I am saying that... we are getting a huge downpour. Love the duck! As for the bouncy house, I'd go with "d." Urine is not a health threat! It's said to be pretty much sterile. I'd worry more about a kid with a cold. yay Yard sale season! !! Phewwie pee pee boucies. I love darling ducks myself. Mountain man wants to get another pet Musquovey Duck (prob spelt that wrong) we had one for many years she was such a sweetie. How is your pony doing ... any pics? ? Try to find mom or dad of the peed in pants child? Pouring down rain here in Western PA right now. I love ducks too....bouncy house?? Hi Lisa, We too have had SO much rain --but that makes flowers bloom. Our Irises, Azaleas and Rhododendrons are blooming now. Gorgeous!!! I would choose "D" on question Number 2... No worries!!! Kids are gonna get into all kinds of things in their lives. We can't protect them from everything. I'd get the kid out of there! She shouldn't ruin everyone's fun! Pee a big no no. I would alert the management. All you need to do is, let a couple more kids go ahead of yours right? I would do a AND b, I think. Yikers! I'm thinking I'd tell the bouncy house worker to take them out. Those bouncy houses, plastic ball pits, and tube mazes are filled with germs and other assorted disgusting things. I'd try to avoid all that stuff if possible, but if your kids are hell-bent on going, I'd just make sure you wash their hands well and make sure they get a good scrubbing at the end of the day. Life is dirty and goodness knows we don't know what we are encountering out there in the world. Have you noticed a plethora of self-serve food places now? That makes me sick just thinking about it and all the germy folks in front of me. Blech. I avoid those places like the plague.